Nutrient budgets provide an accounting of all inputs, exports, and internal stores for some delineated spatial unit, and in so doing, increase our understanding of how nutrients are utilized. 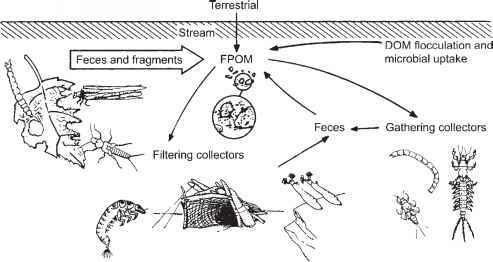 Budgets have been constructed at the scale of the stream reach (Grimm 1987), catchment (Boyer et al. 2002), and large river basin or region (Howarth et al. 1996). Estimates of the quantity of riverine nutrients discharged to lakes and oceans provide critical information for the management of eutrophication, and also are strong indicators of anthropogenic enrichment due to nutrients applied to the land or added directly to the water. By quantifying changes in inputs over time and comparing catchments that experience different intensities of human activity, such analyses have contributed substantially to our understanding of changing anthropogenic influence. A nutrient budget is constructed from estimates of all known inputs and outputs from a defined area. However, depending on the ease with which data can be obtained and the objectives of the study, budget calculations may be restricted to anthropogenic inputs and some terms may be omitted. For a catchment, the output is simply the total mass of nutrient exported by the river per unit time, divided by catchment area so that it is a yield (often reported as kg ha"1 year"1). Catchment inputs include fertilizers, atmospheric deposition, N fixation, and nutrients contained in imported food and animal feed (Boyer et al. 2002). The latter is a net term, as a catchment may import more food and feed than it produces, or the converse. In the case of N, these terms are readily estimated and natural inputs are sufficiently small that their omission is of little importance. In the case of P, the principal anthropogenic inputs are fertilizer and imported food and feed. Natural inputs include precipitation and runoff from rock weathering and soils, and often are small compared with anthropogenic sources (Baker and Richards 2002). Outputs are typically much less than inputs in budget calculations because storage in soils and river sediments is not accounted for and, in the case of N, denitrification can be a significant loss term. Nutrient budgets have proven to be especially useful in revealing differences in the magnitude of various inputs in cross-catchment comparisons, and as evidence that the increasing quantities of nutrients delivered to lakes and coastal waters over past decades has its origin in human activities that have increased nutrient loading to the land and directly to surface waters. 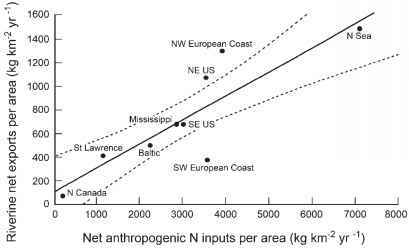 For example, by summing all anthropogenic N inputs, Howarth et al. (1996) demonstrated that the quantities of N exported by major rivers of Europe and the United States into the North Atlantic Ocean are strongly determined by human activities (Figure 11.12).